NEW!! The world’s first SPRAYABLE ear wash! Making it possible to clean the ears without flooding the ear canals. 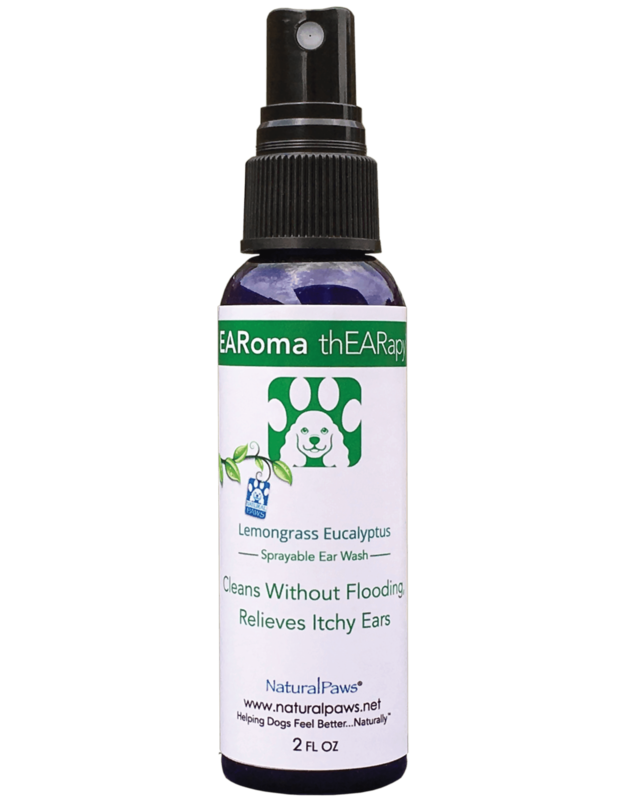 EARoma thEARapy™ delivers Natural Paws’ signature botanical bliss to your dog’s ears. This unique herbal blend gently cleanses, soothes, and disinfects ears with none of the mess. Natural Paws presents the world’s first SPRAYABLE ear wash! Making it possible to clean the ears without flooding the ear canals. As with all of our products, EARoma thEARapy is clean to use, fights BACTERIAL, VIRAL, FUNGAL, AND MICROBIAL infections and is veterinarian & groomer recommended. Clean and easy to use, the spray application leaves ears feeling fresh, smelling of Lemongrass and Eucalyptus. We just bought and tried EARoma for our corgi, who has always been prone to ear infections and wax build-up. We had been using the standard ear rinse that you can buy anywhere. He would tolerate it, but he didn’t like it and it always made sort of a stinky mess when he’d shake his head. So we gave EARoma a shot and he really preferred the spray to the rinse. I still rubbed his ear around to get it worked in a little. And then I cleaned his ears out with q-tips and a cotton pad. It did a great job of breaking up the ear wax, and left his ears smelling great. AND no mess!! Plus he seemed to enjoy it a lot more than the rinse. It’s a great alternative, definitely worth it especially if you have someone who needs his ears cleaned regularly. I’m thrilled with the EARoma thEARapy. Elyse was kind enough to give our Sheltie mix a complimentary treatment when we met at a vendor fair in Prescott, AZ. My dog didn’t scratch her ears for over 24 hours! Once she started scratching again, I sprayed some more in her ear, followed the directions, and once again my dog had relief from itchy ears. Great product! We are in love with our EARoma thEARapy from Natural Paws. Our 4 yr old lab-mix has frequent ear infections which causes him to be extra sensitive about anyone touching his ears. At the first sign of trouble, I moistened a cotton ball and applied to his ears. After only a day, he was no longer rubbing and scratching at his ears! The best part is this is an all natural product that I feel safe using on my pet. Thank you so much for creating such a wonderful product! Four paws up for Natural Paws’ EARoma sprayable ear wash! My Akitas are pretty good patients no matter what I try, but I was thrilled with the easy of the spray application. It allows them to have to “sit still” for a minimum amount of time. I also like the spray because I insist my pet first aid students never “pour” products that they may never get out into their pets’ ears, and this product makes it a breeze to keep on top of wax or debris without soaking the ear canal. The scent is pleasant but not overbearing to canine noses, and it quickly dries to keep bacteria at bay. Love this product. My GSD has chronic ear infections due to allergies. He is on the best food but he sometimes gets ahold of stuff he shouldn’t eat. EARoma thEARapy os the best we have tried. It cleans well, stops the itch, and leaves his ears smelling good all while leaving no mess to clean up after. I am so glad I found Natural Paws. I never worry about the ingredients that are in it and the quality of ingredients is top notch. We will be ordering more EARoma ThEARapy soon (I am almost out) and looking forward to trying other products. I’m amazed at how well this worked for my springer spaniel. He’s had such ear problems, always back and forth with the vet and medicines. This is the first ear wash that has really stopped his cycle of stinky, infected ears. Really appreciate it, can’t wait to try your other products.